Hampshire Mezzanine Floors aim to design all new building entrances and main staff lobbies to be easily accessible by any staff member or member of the public. 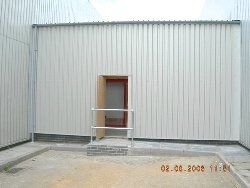 When designing a new entrance, we comply with all new Document M requirements, including door entry systems. The floor is designed not to impede with a wheelchair, therefore at one level or a ramp is installed. Sometimes a canopy is built around an entrance. The main reasons behind this design would be for better weatherproofing and also as a main focal point to potential customers. In the past, Hampshire Mezzanine Floors have built new entrances in the Automotive Industry, Retail and Commercial. If you would like further information to make any modifications to your existing building entrance, or for a general interior refurbishment, please contact us to arrange a meeting.